Inside each dome is a voice or voices that are trying to talk to the other domes. 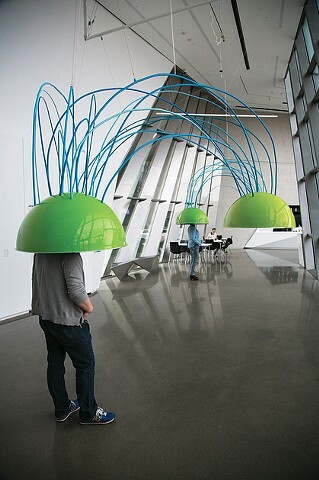 Each dome embodies a person, and the viewer may simply listen or talk back. Though having actual audio inside the domes of the little 'blips' and 'misunderstandings' of conversations created enough of a disorienting 'head space' for the viewer- the installation was added to by having the museum cafe next to the gallery. This allowed for more conversations to bounce off the hard surfaces of the museum and to be mixed into the spaces of the domes. Humorous and disorienting effects occurred that would not have been predicted beforehand.